Make Restaurant Style Mushroom Masala Curry at home using the basic ingredients. This Indian Curry will definitely win your heart and make you crave for more. 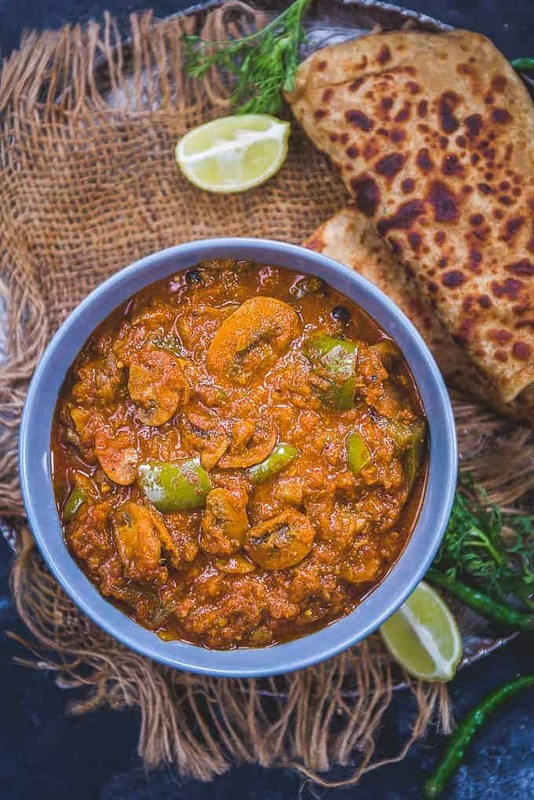 Here is how to make Mushroom Masala Recipe at home. 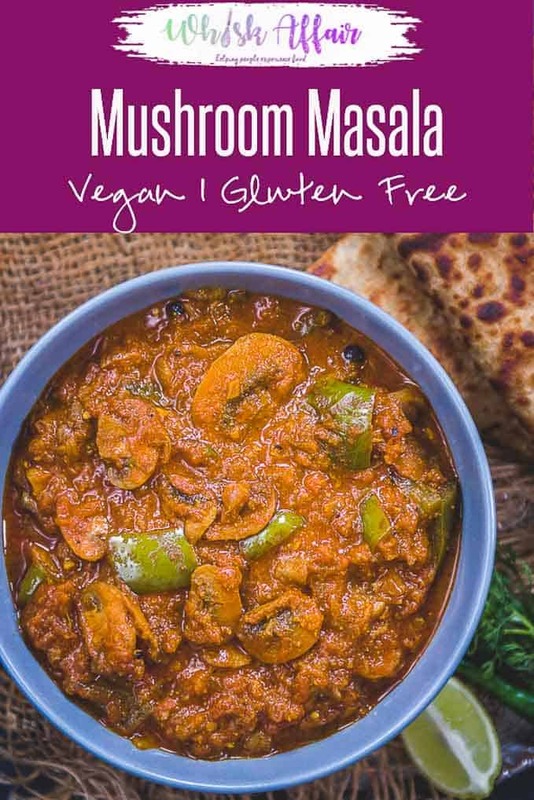 Mushroom masala is a popular North Indian dish that you will find on every Indian restaurant’s menu. What if I tell you that you can make this delicious recipe at home? Yes, this is what is said. It is an easy-to-make, fuss-free recipe. I am sure all the ingredients that you will need for this recipe will be available in kitchen and you might be using them on a daily basis. Make sure you use fresh mushrooms to get the best flavor. 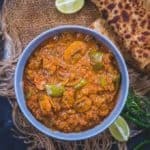 This tomato-onion based gravy is mildly spicy and pairs well with paratha, tandoori roti, rice or any other Indian bread. You can make the gravy thick as per your liking. It can be made as a main dish for vegetarian lunch or dinner or as a side dish with non-vegetarian meal. To make this curry, heat oil in a pan. Once the oil is hot, add cloves, black peppercorns, green cardamom and black cardamom in it and fry for a few seconds. Once your kitchen fills with the aromas, add chopped onions and fry until they turn translucent. Now add ginger garlic paste and fry until onion turns golden brown. Once onions brown, add grated tomatoes and tomato puree and cook for 2-3 minutes. Add coriander powder, red chilli powder, turmeric powder, garam masala powder, black pepper powder and salt and fry until oil starts to separate from the sides. As your onion-tomato base is ready, add chopped mushroom and capsicum cubes and mix well. Cover the pan and cook the curry on low heat for 10-12 minutes. Stir once or twice in between. If the curry is too dry, add some water to it. Add lemon juice and mix well. Serve hot with any Indian bread. This masala gravy can be used to make many dishes. You can replace mushrooms with paneer, soya chunks, or kofta. It has the perfect blend of spices that add the perfect amount of heat and make it a delicious dish. You can choose to add baby corn to make mushroom baby corn masala. It adds to the flavor and the dish becomes more flavorful. You can make it a dry dish as a starter or a gravy based side dish. To make a rich gravy, you can add cashew nut paste to it too. Mushroom Matar is another North Indian delicacy that you will find on every restaurant’s menu. It is one of the famous and yummiest gravies that pairs well with rice, roti, paratha or butter naan. With winter peas in full swing, add some to this gravy. Paneer is a inseparable to Indian cuisine and you can literally add it to anything you make in the kitchen and this curry is n exception. Add a few paneer cubes to Mushroom Masala Curry to give a twist. Make Restaurant Style Mushroom Masala Curry at home using the basic ingredients. This Indian Curry will definitely win your heart. Once the oil is hot, add cloves, black peppercorns, green cardamom and black cardamom in it and fry for a few seconds. Add onion and fry until it turns translucent. Add ginger garlic paste and fry until onion turns golden brown. Add tomato and tomato puree and cook for 2-3 minutes. Add coriander powder, red chilli powder, turmeric powder, garam masala powder, black pepper powder and salt and fry until oil starts to separate from the sides. Add mushroom and capsicum and mix well. Cover the pan and cook the curry on low heat for 10-12 minutes. If the curry is too dry, add some water to it. Matar mushroom SUCH A Mouthwatering recipe, thank you for sharing in a perfect manner.